One fast Mexican has become NASCAR’s reminder that driving talent knows no borders. This year, Daniel Suárez became the first Mexican driver to win a NASCAR national series race, and later the first foreign-born driver to win a NASCAR national series title. Now he’s riding that wave of firsts into a top-tier Cup series drive. Joe Gibbs Racing confirmed in a press conference today that Suárez will take over the No. 19 Toyota in the Monster Energy Cup, which was previously driven by Carl Edwards. The retirement of longtime fan favorite Edwards surprised many yesterday when it was first reported, and has been confirmed today. Fortunately, the Gibbs team didn’t keep us waiting on naming their new driver like certain teams in Formula One keep doing (ahem). 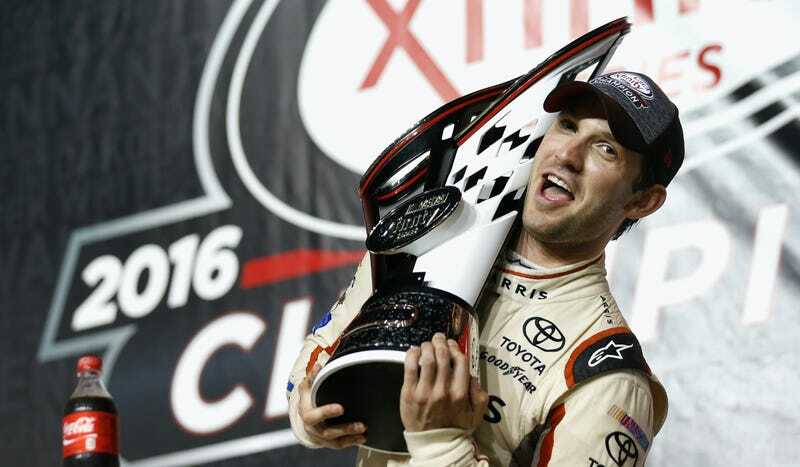 Rather, they named a guy who certainly deserves a promotion to NASCAR’s highest level after winning its second-tier Xfinity Series championship: Daniel Suárez. Suárez’s promotion into the No. 19 car makes him the first Mexican driver to compete full-time in NASCAR’s top-tier Cup series, per USA Today. Suárez is a 25-year-old native of Monterrey, Mexico, who moved to the United States several years ago with the goal of competing in NASCAR’s upper series. Suárez doing well was been a breath of fresh air in a politically awkward year where NASCAR personalities kept publicly expressing support for xenophobic Cheeto-elect Donald Trump. Unfortunately, this means that the perennial runner-up Carl Edwards will retire without a top-tier Cup series championship to his name. Edwards will be leaving to enjoy life outside of the “all-encompassing” world of NASCAR, and leaving fans to consider the myriad what-if situations that would have given him a much-deserved Cup title.